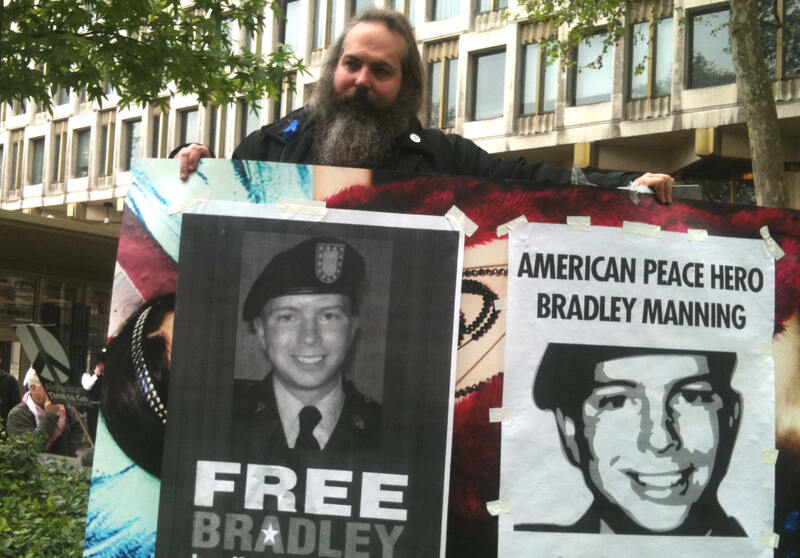 Anthony Timmons (pictured above at a previous demo at the US Embassy) will speak about Bradley Manning as part of the Truth, Justice and the American Way? demo called by London Guantánamo Campaign. Where? Outside the US Embassy, Grosvenor Square, W1A 2LQ. When? Tuesday, 6 November, 6-8pm. Why? To protest ongoing abuses of human rights and collusion between the British and US governments. More info: London Guantánamo Campaign or email london.gtmo@gmail.com”. Please come and show your solidarity with Bradley Manning, who will have been detained by the US without trial for 900 days on 8 November. President Obama, commander-in-chief of the military that will oversee Brad’s court martial, has already declared Brad guilty and has waged an unprecedented war on whistleblowers. Gallery | This entry was posted in Announcements, Manning and tagged anti-militarism, anti-war, Bradley Manning, Britain, demo, London, Obama, solidarity, US election, US Embassy, WISE Up. Bookmark the permalink.